...brought to you by the letter "D" and the number 19. Tuesday afternoon after work, I had a voice mail from my attorney. Simply, "call us when you get a chance"... I've been a bit busy, so I figured I'd call Wednesday. As Wednesday came and went, I totally forgot. Today, I glance down at my calendar, and see the number sitting there, so I called during my second period break. Her (paralegal): "did you get it yet?" Me: "I haven't received any mail from you..."
Her: "oh.. well the final judgement is in the mail, you should get it today or tomorrow." Me: "well, thank you, but that is somewhat anticlimactic." Her: "usually people are really excited." Me: "don't get me wrong, it's just that I was expecting champagne & confetti." Once I got off the phone I cried some tears of relief... after a year an a half (at least the legal part...), it is finally at an end. 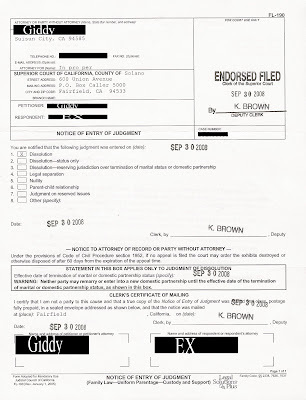 I am finally, "officially" divorced. And really, it's funny, as I sat there getting rid of a bit of emotional congestion, I thought, "nothing is technically different than it was yesterday... I don't plan to get married right now, so what does all this actually mean?" It means I am finally, technically "free." One of the biggest differences between my life right now, and my life two years ago is that NOW I have someone I want to share things with. Someone I WANT to share everything with... then... it was someone I HAD to explain myself to. I was driving to faire opening weekend, and thinking (as one will do during a 2 1/2 to 3 hour drive), and realized: it is so nice to be driving toward something wonderful, versus driving away from something I want to escape. I've always loved faire, and I've always seen it as coming "home" after a year away... yet, it has always been an escape for me. Not anymore. Faire is a destination, it is driving TO a person and a place I love, versus AWAY from a life I hate. A lot of you said, "I've seen the married Giddy at faire, I'm fully afraid of the Single Giddy at faire." I knew... from the first time I heard that sentiment, that you were wrong. Who you see now, is much closer to who I am... the person who is real inside of me. The Giddy I was before... well, she was the one avoiding and escaping reality, and she was a character. I'm still me, I'm still fun, I'm oh so much happier than I ever have been... I'm also more true to reality. Come by Stromboli/Toad this weekend (I'm not on the counter this year, I'm in the kitchen, but ask for me), I'm bringing a bunch of champagne, I want to do a toast with each and every one of you. It's celebration champagne... meet Giddy... she has a boyfriend she loves dearly (and who is getting to toast with the "special" champagne), she wants you to meet a person who isn't uncomfortable with life anymore. Come meet someone who is fully happy with herself, and is well on the way to being the person I always knew was inside. no matter how goofy the person you are may be. I'm crying over here I'm so happy for you. I knew what wonderful spirit you had married to that thing, and I KNOW you are so much happier now! I love you and I'm so proud of you! I love that you're part of my chosen family. I could not be happier for you. WOOHOO! Congratulations. I have goosebumps. I'll hoist a rum for you Saturday! I love you and am thrilled that you are finally free to be who you truly are without having to sneak around to do it.